The exciting showdown between Wichita State University and Kansas University has some fans wondering about that latest injury to KU’s Perry Ellis. While trying to catch KU up and above the score, Ellis was knocked in the face with WSU’s guard’s elbow. 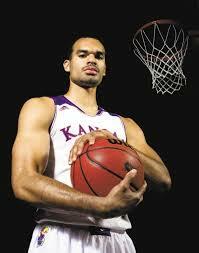 Perry Ellis suffered a major nosebleed and possible bruising around the bridge of his nose. But, was this an intentional attack to get Ellis out of the game for good? Was the elbow to the face supposed to do more damage than previously thought? What do you guys think about it? Could the elbow to the face have been an accident as the referee called it? Let us know in the comments.